Detective Sean Dodge began his career in law enforcement with the Modesto Police Department in 1997. Since the beginning, his passion has been working with the youth in the community. Detective Dodge has been a volunteer with Big Brothers/Big Sisters, a D.A.R.E. Instructor at the elementary and junior high school level, the P.A.L. Director for the Modesto Police Department, a mentor with Discovery ChalleNGe Academy, and, for the last ten years, a detective with the Special Victims Unit. Within his current assignment, his primary responsibility is working with youth who have been the victim of physical/sexual abuse. Detective Dodge began running in 2003 and hasn’t stopped. He has participated in several marathons throughout the county and has the ultimate goal of completing a marathon in each state. He also recently qualified for the 2019 Boston Marathon with a finish time of 03:16:04. Recently, Detective Dodge has combined his love for running with his passion for the youth. He now acts as a mentor with the Teens Run Modesto Program and regularly runs with at risk youth on his days off at a local elementary school. His ultimate goal is to provide mentorship, good relationships, and a positive environment through running to all the schools within his community. Detective Dodge has the desire to find other first responders throughout the country who have the same passion to mentor youth through running within their own community. Erick Ortiz has been a Los Angeles police officer for 14 years and has had the privilege to work in the Watts area for the last 13 years. Currently, he's assigned to a unit that works in the housing developments, to help bridge the gap between the community and the police, along with critical enforcement. While in this current assignment he's been given the opportunity to mentor several kids from the community. He found that there are several kids who live in the developments that can't go outside because of the gang violence that occurs, feeling like prisoners in their own homes. He wanted to try to change that by giving them an opportunity to go outside their homes and participate in a sporting activity. Erick's passion has always been running, doing long distance for the past 14 years. He says he's been fortunate to have met several kids who like to run too, and through running he has built a bond with them, giving them a way to unwind, clear their thoughts and just have fun. They can act like kids and have fun without the fear of gang violence. Running with his mentees has allowed Erick to show them different parts of the great city of LA from the beaches, to the trails at Griffith park, Hollywood sign, to our his police academy. He finds rewarding to see the kids complete a 10K or even a half marathon, claiming this is what it's all about, building a bond with these kids and helping them achieve their goals in running and in life. And through running all this can be accomplished. Just like these kids look up to him for inspiration and guidance he looks at them for inspiration. They inspired Erick to to run the Run to Remember LA 2018 and Boston in full uniform, motivating and encouraging him to run and complete the race. Erick has been given a wonderful opportunity to work and mentor kids from an underserved community, and together they are making a difference, one race at a time. 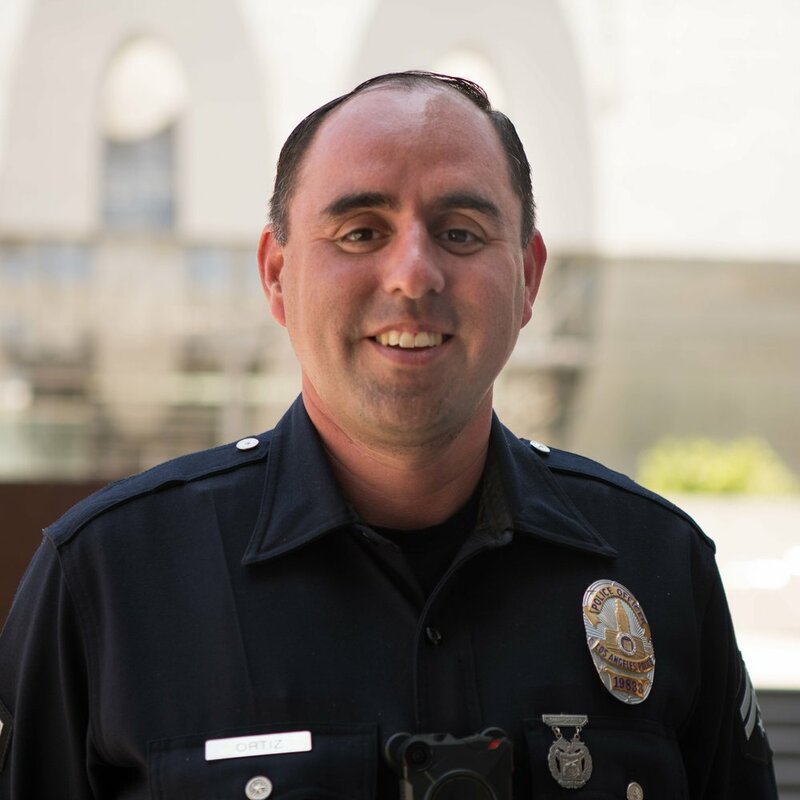 Gang and Narcotics K-9 Officer Joe Cirrito is currently assigned to LAPD’s GND K9 Unit as a Blood Hound Handler. Joe was inspired to become a police officer after his former teaching colleague, Dominick Pezzulo, who became a NY/NJ Port Authority Police Officer, died saving others on 9-11-01 after the North Tower of the World Trade Center collapsed. Dominick was only on the job for 13 months. After Dom’s death he pursued to become a LAPD Officer to honor his hero and finish what he started. Dominick was a good man with enormous passion for serving others. He is a role model and Joe started running in full uniform in his honor. Joe loves his job, “Protecting and Serving” others. He has had some great assignments during his career. Prior to becoming one of the newest LAPD K9 Officers, he was a Senior Lead Officer at LAPD’s Olympic Division. He worked LAPD’s Gang Unit in both LAPD’s Southwest and Olympic Division and worked Patrol as a Field Training Officer. Every day is an adventure! Joe has been running in Full Uniform to Remember those who have given the ultimate sacrifice since 2016. One of his most challenging runs in full gear was 2016’s Project Endure from LA to California’s Fallen Officer Memorial in Sacramento. It took him and his running partner, LAPD METRO Officer Kristina Tudor 10 days to complete the 420 Mile Run. Creating relationships with our community is important to Joe. Running in local running events and running with our young community members helps start that long lasting positive relationships. Neil Cervenka is a Lieutenant with Turlock PD, California. He's 43 years old, married with two teenagers and grew up in northeast Wisconsin and left for the Air Force in 1993 the day after he graduated high school. He was stationed in Montana, South Korea, and California, and settled here and stayed in the USAF Reserves until November 2002, deploying to Germany and Egypt. Neil started with Turlock PD in 2000. In 2009 he was 270 pounds, a smoker, and very out of shape. He decided to walk up a steep hill in San Francisco and thought he was having a heart attack. That gave him the resolve to get in shape and he began eating right and walking. After a few months, he started to run short distances and within nine months he had lost 80 pounds, quit smoking and was running seven miles a day at a 7:30 pace. Neil has always been involved with the youth in his community, either at work with the Explorer program or at church or the Police Activities League. He has come to see the impact kids will have on society if they are given the right attention and guidance as youngsters. Neil can't wait to see what the young runners in 10K with a Cop will achieve in their lives! This is a great way for the community to get to know their police officers and understand they are truly here to help. Besides running, Neil also enjoys photography, cars, bicycling, swimming, and learning. He finished his MBA and he's always looking for a new adventure.